"Effective December 21, 2012, the United States Department of Agriculture declared the European Grapevine Moth to be eradicated from Santa Cruz County. Our county is no longer under quarantine." Not too much to add to this, but getting to this point was a real team effort on the part of regulators, researchers and growers. And I am quite glad that we have one less pest to deal with here for now. As stated before in this space, Canada is expected to follow suit in short order. This was a team effort and it is time to give credit where it is due. Thank you to Lucia Varela of UCCE, Santa Cruz County Agricultural Commissioner Mary Lou Nicoletti, Sam Cooley of Driscoll's, and Leah Gayagas and John Fergusen from the USDA. It's a beautiful day in the Pajaro Valley. 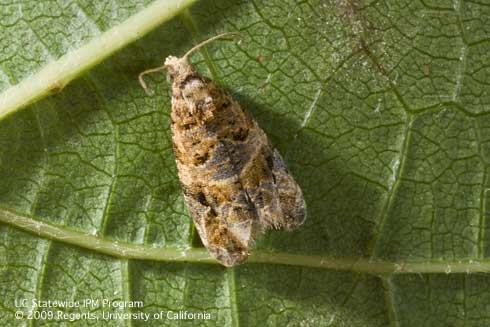 European grapevine moth adult: no longer a problem for California caneberry growers. 1. European Grapevine Moth (EGVM): Thanks to efforts of the USDA, the Santa Cruz County Agricultural Commissioner and UCCE, the EGVM Technical Working Group has determined that evidence in the literature is scant, contradictory and does not support regulation of Rubus, and therefore recommended that this plant genus no longer be regulated for EGVM. Once this recommendation is written into the Federal Order (expected to happen in March, but could be later), caneberries will no longer be regulated for EGVM. It is supposed at the level of the California Department of Food and Agriculture that Canada would also then allow caneberry fruit in again without regulation. 2. Light Brown Apple Moth (LBAM): Light brown apple moth continues to be a regulated insect in strawberries and caneberries. Therefore, inspections by the USDA of harvested fruit will continue this season, and LBAM positive larval finds at the cooler will result in field inspection and possible closure of at least part of the production field until the infestation has been eliminated. Since a LBAM moth flight generally starts to take place in March, it is strongly recommended that growers start to now put out the pheromone based twist ties available to them from the Santa Cruz County Agricultural Commissioner. 3. Brown Marmorated Stink Bug (BMSB): No finds of this pest yet in this area, but there have been several finds in Davis last year and one that I know of personally earlier this year. The positive of this pest not being regulated is unfortunately heavily tempered by the difficulty of its control. While it is by no means destiny that brown marmorated stink bug actually gets here, it is nevertheless good to be alert that the possibility has become greater over the past year. As many readers know by now, raspberries destined for sale in Canada have been included in the European grapevine moth (EGVM) quarantine. Raspberries are on the host list for European grapevine moth in Canada (but not the USA) and quite likely this has something to do with the rather nebulous description of Rubus spp as being a host in one or more older papers (like early 1900's sort of old) on this pest. Raspberries are Rubus ideaus, while blackberries arise from a wide number of species within Rubus. Currently, raspberry growers within the quarantine area, loosely described as being to the west of Green Valley Road, Dalton Rd and on out to Casserly (see attachment below), are not eligible to ship into Canada. At any rate, the USDA Project will not be inspecting raspberries within the quarantine, they will only continue to inspect blackberries. Raspberries within the quarantine that would be eligible for export to Canada will be undergoing inspections and subsequently be issued compliance agreements next week by County Agricultural Commission personnel. I do not yet know how this inspection will be done, but we will find out that out very early next week. 7/6/11 Update: It looks like shippers who have raspberry fields within the EGVM quarantine area from which they want to export fruit to Canada would be subject to the same inspection regime as for all blackberries- ie 20 lbs of fruit from 40 acres of raspberries. These fruit would be inspected by County Agricultural personnel rather than USDA personnel. It is of course very advisable to growers that they keep their fields clear of leafrollers to the extent possible. So, questions about export of blackberries should be directed to the USDA Project 796-9699 and questions about the export of raspberries should go to the Santa Cruz County Agricultural Commissioner's office 763-8080. 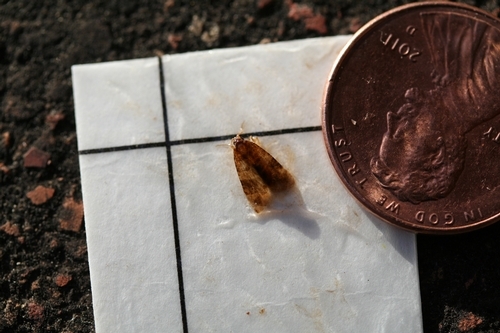 1- European grapevine moth is a surprisingly small moth, as one can see from the picture below. The larvae are also very small, so if you find a leafroller longer than a quarter inch in your blackberries, it is assuredly light brown apple moth or another leafroller and not European grapevine moth. 2- More information on the slim possibility of blackberries as a true host of European grapevine moth. Colleague Lucia Varela has provided me with a paper from the European Journal of Entomology (Stavridis, 1998) finding that European grapevine moth larvae did not survive when reared on blackberry fruit or flowers, but then a doctoral thesis from the Université Bordeaux 2 in 2002 identifies Rubus as a potential host. One of the crucial pieces of evidence for this identification is a book written by a P. Marchal in 1912, which we have not been able to find in order to confirm the citation as legitimate (if any of the readership here knows of a copy please let me know! It's pretty important). Underlining the dubiousness of the blackberry-as-host hypothesis, researchers in Europe, where this pest is native, have never seen European grapevine moth on many of the hosts cited in the work above. 3- A number of fields have been inspected, and as expected all have been found to be negative for European grapevine moth. Additionally, as a testament to the success area blackberry growers have had in controlling light brown apple moth, I have not heard of any finds of that pest either in these inspections. The regulations have been modified a bit now so that growers being inspected for European grapevine moth every thirty days are considered as inspected for light brown apple moth at the same time. The photo below is of the inspection process (which takes from 20 to 30 minutes), and, as described before in this space, it is fruit by fruit. The inspectors are professionals, very thorough (and friendly too) and there is no doubt they will find larvae if they are present.